The rare, final state of Mortier’s famous map, which is the earliest obtainable map to depict the ‘Mer de l’Ouest’. This exceptional example was responsible for the perpetuation of a number of geographical myths concerning the westernmost regions of the Western Hemisphere and the easternmost of the Eastern, including the ‘Mer de l’Ouest’ (Sea of the West’), the ‘Strait of Anian’ (Northwest Passage), the supposed land bridge between North America and Asia, and a vast landmass labeled ‘Terres Inconnues ou Terres de Jesso’, which connects North America with the ‘Terre de La Compagnie’ (the Kurile Islands of Russia and Japan). Farther south in North America are two distinct peninsulas, the southernmost seeming to be an oversized Baja California, with a smaller Baja to the north. This is the only known map which includes these particular features. To the west the map depicts the outlines of much of Western Australia as reported by the discoveries of expeditions of the Dutch East Indian Company (VOC). The eastern coastline is conjecture, as it would be nearly half a century before it would be explored by Europeans during Cook’s First Voyage (1768-1771). New Zealand is shown with its northernmost coastline almost merging with an enormous unknown continent called ‘Terres Australes et Inconnues ou Antartiques’. Information from VOC voyages in the 17th century contributed to the representation of the Indonesian Archipelago. The Philippines and Continental Southeast Asia are depicted according to information made available in the 17th century, as are many regions farther north, including the coasts of China , Korea, and the southern islands of Japan. Farther north the geography becomes vague, and to the northwest is the ‘Mer de Tartarie’, near the land bridge to North America. Most of the remainder of the map is quite geographically correct. Manuscript maps by Guillaume de l’Isle (1675-1726) are considered the primary source material of the ‘Mer de l’Ouest’ myth, and the ‘Western Sea’ is found in some of his manuscripts at the Bibliotheque Nationale dated as early as 1696. It is thought that his sources might be 16th century maps which have not survived or which have not yet appeared on the market or in scholarly studies. 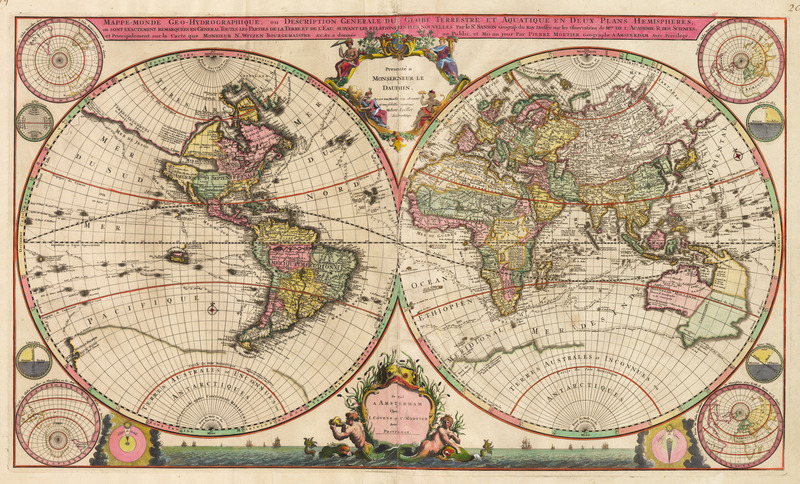 The first printed map to show the mythical sea was Le Globe Terrestre Represente En Deux Plans-Hemispheres (First State, Paris, 1700) of Jean-Baptiste Nolin. This is a large wall map measuring 3 x 5 feet, of which three copies are known, all in institutions. Nolin’s map suggests it was copied at least in part from a Guillaume de l’Isle manuscript globe which de l’Isle presented to the French Minister of Justice in 1699. Nolin’s use was unauthorized, constituting geographic plagiarism for which de l’Isle sued him. The courts found Nolin guilty and he was ordered to stop using de l’Isle’s image. All copies of Nolin’s map were ordered destroyed and the offending areas of his copperplates were to be rubbed clean. Nolin thus was compelled to issue a new map based on other sources. Condition: This rare and remarkable map is in A condition. The color of this large format map is primarily original with some later enhancement. A separation due to oxidation of the original green coloring has occurred in an area in western Africa near Cape Verde.